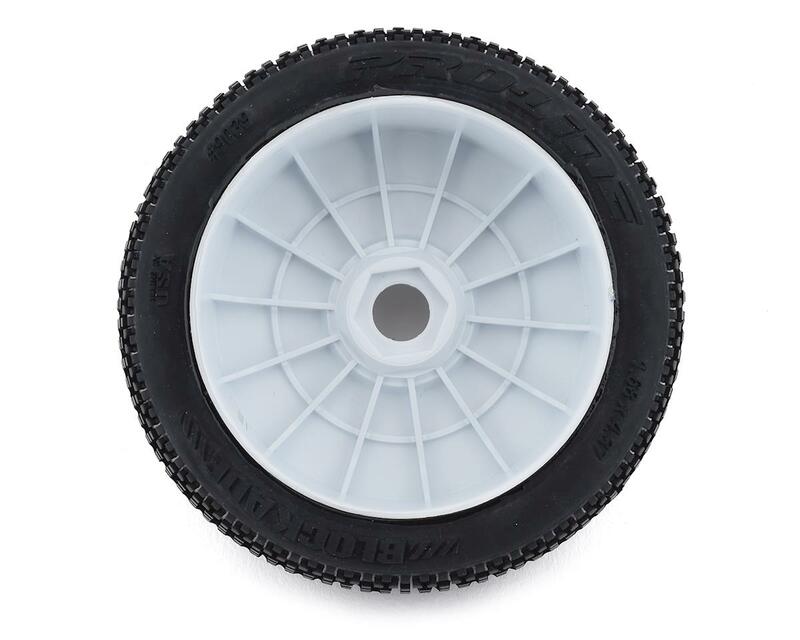 This is a set of two pre-mounted Pro-Line Blockade 1/8 Buggy Tires, premounted on white Lightweight Velocity wheels. Historic. Revolutionary. The Best. 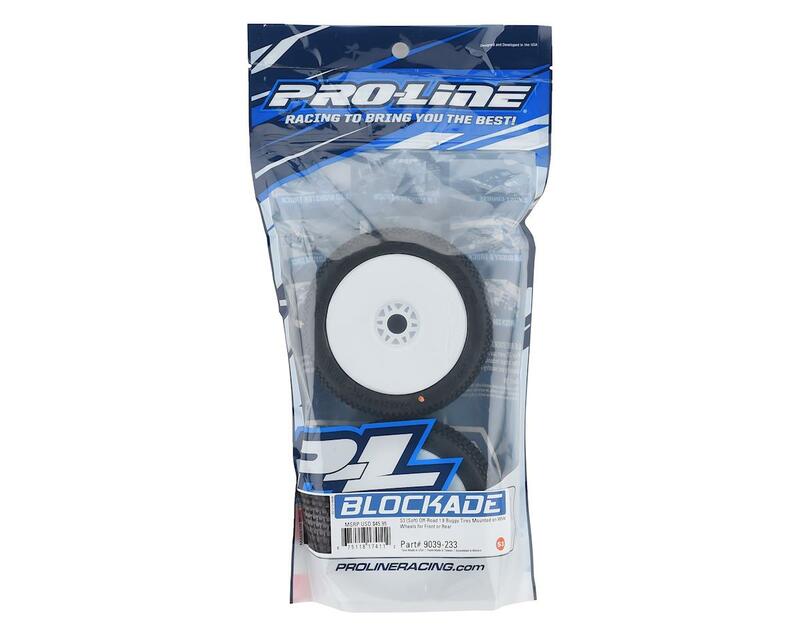 Just a few words that have been used to describe Pro-Line's Blockade tire. History was made the first time the Blockade touched the race track – Winning the 2011 ROAR Fuel Off-Road Nationals by 2 laps at the hands of Ryan Cavalieri! The Revolutionary tread design features large lugs for class leading tread life, perfectly balanced tread spacing for maximum forward bite and uniquely blended side tread that reduces the edginess found in other race tires. 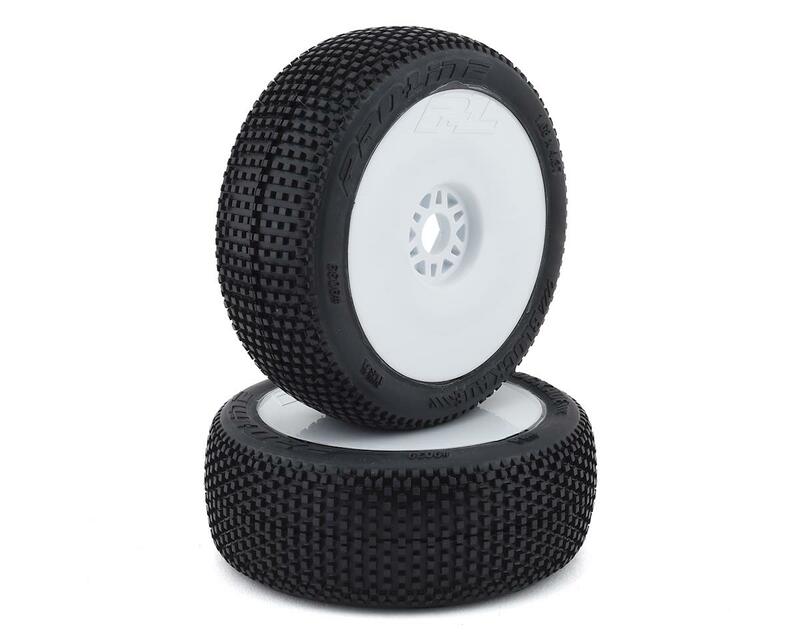 This tire will give your 1/8 buggy the speed of a qualifying tire, with tread life capable of handling hour long A-mains. Pro-Line lives and breathes the philosophy of Racing To Bring You The Best and that is exactly what the Lightweight Velocity 1/8 Buggy wheel represents. Pro-Line engineers worked tirelessly to create the lightest possible wheel without compromising strength to give your buggy the lowest rotating mass and the fastest acceleration ever achieved. The lighter wheel also has a slightly higher level of flex which results in more traction in loose track conditions. The Lightweight wheel is marked with Pro-Line’s latest P-L logo giving your buggy looks that match the performance. Click here for Pro-Line Tire Compound Chart.